Fact 3: Dividend (MHP) and profit sharing (MLA): Returned record-setting payout of $15.9 million. 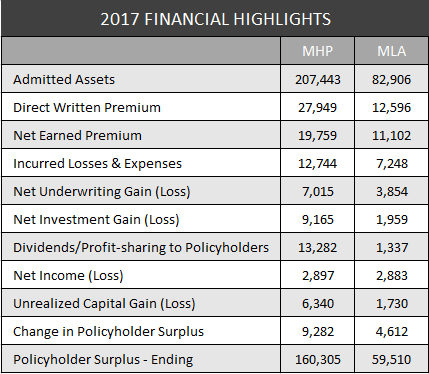 MHP and MLA are two of the strongest insurers of hospitals and healthcare providers in the USA based on financial capital backing their operations and historical loss and expense ratios. MHP’s Best Capital Adequacy Ratio (BCAR) is unsurpassed in the medical professional liability insurance sector. Likewise, MLA is ranked at the top of insurers who specialize in protecting physicians. If your insurer is not rated by A.M. Best, it may be that they do not want to publicize their weakness. But please don’t take our word for it – ask your agent or broker to explain BCAR and then compare your current insurer’s BCAR to that of MHP or MLA. According to A.M. Best, “In determining a company’s ability to meet its current and ongoing obligations to policyholders, balance-sheet strength is the most important area to evaluate, since it is the foundation for policyholder security.” MHP and MLA both have Premium to Surplus ratios surpassing virtually all competitors. The HSG Companies have weathered hard and soft markets and several “crises” over the past 42 years. They have specialized in protecting community and rural healthcare operations in the heartland of the country and know this market well. Most of all, they understand that stability is grounded in sound risk assessment coupled with customer loyalty. Once on board with MHP or MLA, you can expect fair treatment at a fair price with profit sharing when the companies are profitable. Who does your current insurer share their profits with? A.M. Best rating for Missouri Hospital Plan and Medical Liability Alliance was reaffirmed for the 5th consecutive year as A (Excellent) with a Stable outlook.